I love the concept of Suicide Squad. The whole movie is predicated on the idea that bringing together a team of the world’s most dangerous criminals would be a great way to fight crime. Fight fire with fire, right? Their lives are expendable so if they don’t succeed it’s no great loss. The collection of a ragtag team of ne’er-do-wells has formed the basis of great films from The Dirty Dozen to Guardians of the Galaxy. And yet, the notion of assembling crooks to fight their own is inherently ridiculous. So if you can get past the illogical set up, you’re half the way there into buying this hokum. The key thing is to set up an engaging group of characters that we want to embrace. It doesn’t matter if they’re good or evil. Give them charisma and we’ll follow their adventure. The assortment of convicts here is also known as Task Force X. “The worst of the worst” as Amanda Waller (Viola Davis) calls them. She’s the high ranking government official who oversees them. At her side is Col. Rick Flag (Joel Kinnaman) who is responsible for executing her orders. He directs the baddies in the field. But as we find out, deep down they’re really not so bad at heart. Let’s start with the slightly more interesting people. There’s Deadshot (Will Smith), a dangerous assassin with impeccable aim. He also has an 11 year old daughter for whom he’d do anything in the world. El Diablo (Jay Hernandez) has pyrokinetic abilities. However he is reluctant to use them after accidentally killing his wife and daughter from setting a building on fire. The best character is Harley Quinn in a star making turn by Margot Robbie. If this superhero movie has any hope for longevity in these seemingly endless comic book adaptations, it will be because of her. Honestly they should’ve called Suicide Squad, The Harley Quinn Show. She is the reason to see this picture and easily the most compelling outcast. She’s the psychiatrist that became a psychopath. Face smeared with pale makeup, she wears her hair in colorful pigtails, wields a baseball bat as a weapon and giggles incessantly. She knows more than her male cohorts but downplays her smarts with a flirtatious wink. She certainly outshines her boyfriend, none other than the Joker (Jared Leto), a former patient now turned paramour. Ah yes she’s motivated by her love for him. Given all the advance studio promotion of Leto’s appearance, you’d think he was the star of this joint. He’s nothing more than an expanded cameo here – neither the main villain nor a member of the squad – only Harley Quinn’s boyfriend that pops up briefly to rescue her in a scene. After months of online hype, it’s hard not to feel a little cheated. Let’s not forget the section I call “and the rest” on the team: Captain Boomerang (Jai Courtney), Killer Croc (Adewale Akinnuoye-Agbaje), and Slipknot (Adam Beach). Rick Flag’s bodyguard Katana (Karen Fukuhara) joins the gang too I think. It wasn’t clear to me whether she’s an official addition or just sort of tags along. Regardless none of the remaining constituents are able to register a definable personality in this loud cacophonous mess. In an adventure where everyone is a lunatic, the main evildoer should be pretty boffo. Instead we get the Enchantress, an archaeologist who becomes a powerful sorceress when possessed . She’s played by Cara Delevingne. The model turned actress simply doesn’t have the gravitas to play the arch villain that should anchor a production such as this. It’s not apparent at first, but suppressing her ultimately becomes Task Force X’s main objective. The plot is confusing. We get so many incidental asides that give backstory as to how these felons came to be. A chemical baptism flashback between the Joker and Harley Quinn has some promise, but with so many tangents, it’s easy to lose track of all the random individuals. The film descends into tired action picture clichés with overstuffed commotion. The rapid fire cut and paste edit aesthetic does nothing to uplift this feature. The characters disappear under the weight of discordant madness and haphazard editing. The movie poster promises a colorful psychedelic mushroom cloud extravaganza. Yet in reality the production is actually a dark, dimly lit slog with a surprising lack of color. I’d fault Suicide Squad for not having a story, but that’s not really the point. Introducing a bunch of characters is the plot. This is an excuse to create archetypes and parade them around for 123 minutes in a gleefully exuberant devil-may-care spectacle. That might have been acceptable. 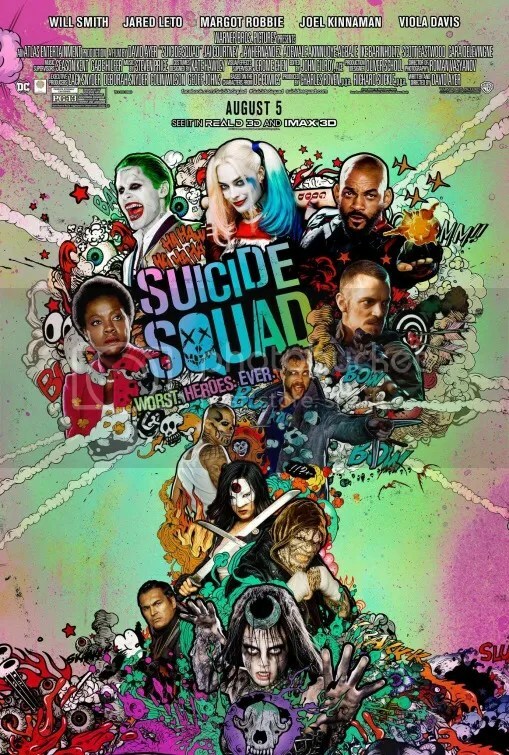 If every member of this battalion had as much pizzazz as Harley Quinn (Margot Robbie), I’d be loving this flick. If I had to name one other MVP, it would be Viola Davis as their governmental superior. She is often the voice of calm in a calamitous haze, reciting exposition to clarify the script’s more ambiguous passages. Three installments into the DC Extended Universe and I can see things are improving. The problem is that the rest of the cast is lacking. Not the actors’ fault. Their parts are simply underwritten. Suicide Squad is better than Batman v Superman. I’ll give it that. It’s just that it still has a ways to go. This entry was posted on August 6, 2016 at 9:18 pm and is filed under Action, Adventure, Comedy, Drama, Superhero with tags 2016. You can follow any responses to this entry through the RSS 2.0 feed. You can leave a response, or trackback from your own site. I thought Will Smith had a lot of charisma but you’re right it is a mess. No doubt about it. Margot Robbie is so good, she outshines her co-stars. If the rest of the cast had been up to her level, I might’ve given this movie a pass. It’s actually kind of fun in parts. I don’t know if I’m ready to call it better than BvS. Well, better in a entertaining, irreverent way for sure. I’d watch this over that more times than not, but I do think that BvS may have been the better technical film, in spite of all of its issues and studio clashing. Robbie does damn near carry this film on her shoulders, though, and that is with good work from Smith and Leto. Smith is by default, one of the better characters but Jared Leto is a serious disappointment. A year ago when they were promoting this at Comic Con, I thought he was the star. As time passed, it became clear he would be part of an ensemble but an important part at least. What a shock. His role is so small here that even if they edited him out completely, it would have no effect on the story. Why the bait and switch?! In these cases of studio meddling, it’s always impossible to determine the REAL story. I’ve always maintained there are three sides: the studio’s, the director’s and the truth. Apparently, Warner Bros. wanted a lighter version compared with David Ayer’s more somber tale. It’s been reported that the studio brought in multiple editors (uncredited in the final version of the film) and then demanded reshoots to support this new direction in tone. Now that the film is out and people are claiming it’s a mess, people are quick to blame the studio. Yet I actually liked the lighter parts. I mean look at that poster. It promises a fun film. Who’s to say the film wasn’t a mess before they started editing it. We’ll probably never know. Cool review! The cast was really great but you’re so right – the story is all over the place and the movie definitely needed a stronger villain. Yeah Cara Delevingne wasn’t very threatening. We might disagree on who was better or worse in this film character/acting wise.. but for the most part..agree. I think there is a good film in this series..this just wasn’t it. It misses the mark, but it came close. I am officially done with this new continuity. I think this movie is absolutely awful. Joker is awful, Harley Quinn is offensively bad, there are tired ethnic stereotypes with El Diablo and Killer Croc. Will Smith is completely miscast, but he does manage to carry the film even with the terrible script he is given. The editing in this is absolute garbage. Scenes don’t flow together whatsoever, the jokes are mediocre at best, and annoyingly juvenile at worst. This movie takes the cake. The universe is doomed to crash and burn. Since you use a phrase like “new continuity” I assume you’re a fan of the comics. I don’t know this storyline from another, but yeah, this one was confusing. The first half, I really enjoyed. Harley Quinn was my favorite. Will Smith was also amusing. 2nd half made no sense to me. Typical superhero ending. The production had its moments, but the script just couldn’t maintain a coherent narrative. I agree that assembling crooks to fight their own is inherently ridiculous. I’ve heard that aside from Harley Quinn, most of the other characters don’t get development, which is disappointing. I also think it is cheap to play up the Joker’s appearance for an extended cameo. Words like “cacophonous mess” and “overstuffed commotion” that you use to describe the movie in your review are the exact ones that have really deterred me from seeing this picture. It just doesn’t seem worth my time. Surprisingly it seems to have performed quite well – 4th biggest hit of the Summer!